Happy New Year Salt Spring from all at the library. 2014 was a marvelous year in which we enjoyed welcoming the entire community to our facilities, our services and to the events we hosted. 2015 is already off to a great start, with new books on the shelves and new events in the calendar. We look forward to seeing you here soon. On Friday the 2nd of January Games Night returns. Join us for an evening of board games and other interactive games, facilitated by the ever-enthusiastic Bryan Dubien. 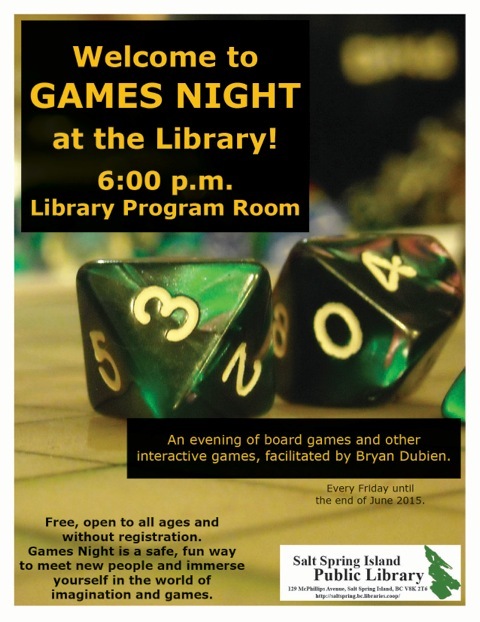 Free, open to all ages and without registration, Games Night is a safe, fun way to meet new people and immerse yourself in the world of imagination and games. Join local author Jordan Stratford for the launch of his novel The Wollstonecraft Detective Agency. Tuesday 6th January – 6pm in the Program Room. For further information about these and other events see our online event calendar.